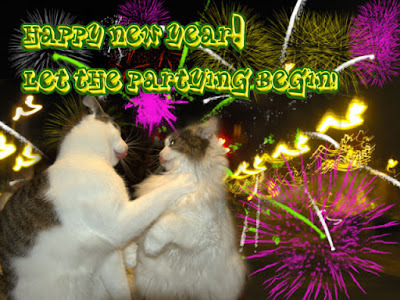 Have a safe, happy, healthy, wealthy, fabulous New Year! We are thankful for all the things that are good in our lives and are looking forward to many more wonderful things for 2009. We wish Love and Happiness and Peace to all our friends and family. Kisses and hugs to you all for being the wonderful beings that you are. We bouf haf a story to tell. Schmaybe we should haf saved dis for Tales on Toosday or Tursday, but we got to tell someone. We am so embare-assed we don't know where to start. Da beans had some bisitors ofur dis weekend. We wuz on owr bestest behavior reely. We ated ferst afore da peoples came acoz yoo know we eats raw chick-hen an it duzn't look too pretty to some beans what wif us usin' da floor an not owr plates an all. Den da red marrow stuff comes owt an well it gets a little gross for humans to look at. So da bisitors came ofur an we all sat at da table to talk an eat (after owr chick-hen remains were gone natchurley). Angie sat in her own chair at da table an she wuz nice an quiet like. I sat in da ofur room on mine own chair just listenin in for food to hit da floor like I always do. I efun only wented into da cabbynet up on da counter once to get myself a little treat. An dey saw, yes, dey saw. 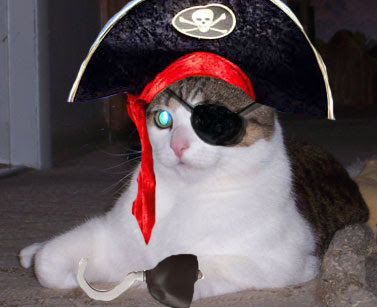 And, oh yes, Santy Paws did leave me some new seafood flavered treats. It wuz not until da nice peoples left dat we noticed dare wuz a little problem. It seems dat after da Dad bean cutted up owr raw chick-hen he washed his hands in da baffroom sink (why dare an not in da kitch-hen sink we don't unnerstand) and it seems he, ur, left some of owr chick-hen in da sinkie. Just some little pieces yoo know. Just a cupple of yellow an red little pieces. Just enuf to look like someone blew chow in dare. Or blew dare nose wifout a tisyew. Yoo know, just enuf. Now we not sure what dem nice peoples were finkin when dey saw dat, but dey all went in dare one by one during dare bisit. Did da beans go in dare? Nope. Not until da peoples were gone. And den Mommie saw it. She saw dem little pieces of chick-hen an efun she wuz not shure if someone blew chow or not. We haf a feelin' dat da peoples might not be comin' back next year for dare yeerly bisit. Yoo fink? What da??? Where are mine treats? I know Santy Claws must haf brought some for me. Where are day? Mrrffffrrrfpphhh ur ur merrrreeowww. Dis is absolutelee a scary fing not to find mine treats! Mommmmmmm! Where are mine Organix treats! Happy holidays from our house to yours. 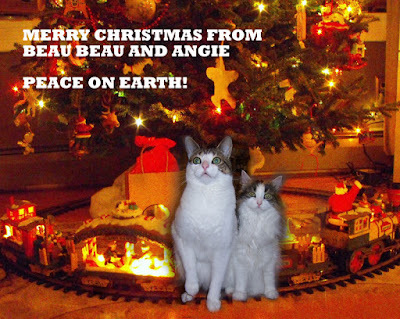 Merry Christmas and Peace on Earth to all our blogging furriends and their families. Wishing you a healthful, peaceful, and happy Christmas and other holiday if you are celebrating at this time of year. We are especially happy because since Dec. 21 the days have now started to slowly but surely grow longer again. Yippee! That's reason enuf to cellybrate we finks! Let da food fest begin! Yep - it wuz crazy snowin' here in Connecticat dis weekend. Dis picture wuz just da beginning. By da end of it dare wuz a squillion feet of snow an it wuz so high dat I would haf been losted in it. So I could not go owtside thsi whole weekend. It's a good fing too cuz yoo know who is not too good at openin' da window or door for me. Yoo can see to da left of da front door da window dat BB wuz in when he wuz lookin owt at me. But, I wuz safely inside frew dis whole icky storm. Den we gots another surprize. Um, someone, we don't know who it wuz, we finks dare name is Someone, gots owr rug EXTREMELY SOILED! We don't know how dat could be! Don't yoo be tryin' to blame us on dis since yoo hasn't cleaned dis rug in a squillion years, mommie. It duz not seem to matter though duz it? See how pretty it looks now? Just needed to get a little xtra attenshun from da rug cleanin peeple. We promise to keep it clean if yoo keep it clean too. We likes dis rug. Yoo know dat da lady wuz gonna put up dis picture of me wif a wide body shot rite? I finks I'm looking a little model like here tho. What yoo fink? Angie is a tiny girl so she duzn't haf a wide body shot. Yoo see da pillow I'm layin on? It's a warmer pillow. We puts it in da box dat makes fings hot and den it am all warm. Perfect for a snowy day like dis here in Mew England. Stay warm all yoo winter kitties. We bet Poppy Q am nice an warm ofur dare in Mew Zealand efun tho it is rainy. Hee hee - she gets rain, we am gettin snow. 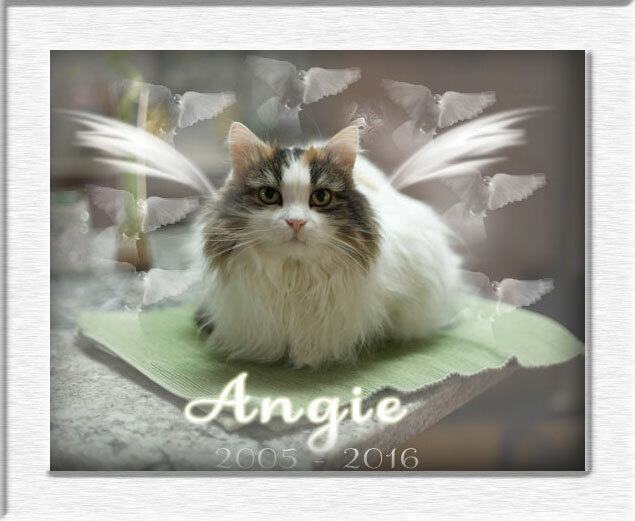 First, I'm sorry I didn't try harder to open da window to let yoo in Angie. "dat's ok Beau Beau . I'll get yoo next time." Heh heh. Da next fing is did yoo know dat a cooked boneless pork roast will make a big SPLAT noise when it hits da floor? It is da funniest noise! It took a lot of heavin' an pullin on da strings dat it wuz wrapped in but I got it to where I wanted it to go. Da beans didn't fink it wuz so funny but I got to lick da floor. An finally, I knows all yoo humans owt there likes to take lots of picshures wif yur flashy fings. Mom's first flashy fing is no more. But she has da charger and some batteries if anyone uses da same kind she used to have. It is da Kodak Li-Ion Rapid Battery charger wif da Kodak KLIC-5001 1800 mah 3.7V Li-ion battery (this one is almost new) and two KLIC-5000 Li-ion batteries. Those two were pretty used and don't last as long but you can try them out. They are yours free whoever can use them. First come first served. Just email us at bentleyblee at gmail dot com and we will send them to yoo. We used them with our Kodak DX700 easy share digital camera. Hey Beau Beau, hey it's me, Angie! Open da window so I can come in! Beau Beau: "Is dat yoo Angie? I don't know. It looks like yoo but I can't smell yoo." Yoo sure dat's yoo?" Beau Beau go get da humans! Tell 'em to open da door! Can't yoo see it's me? I'm gettin hungry owt here. I'm ready to come in an warm up next to dat big stove. Hellllp! Open da stinkin' door! It's about time I got to finally clean my toes. After all da mess in this house I can't keep up wif it all. As soon as da floor wuz gonna be cleaned I had to get my stink all ofur it again. Den I got more dirt all ofur me. I had to clean myself all up again before I heard da "bath" word. Luckily my furs got white again. Today another noisy bang bang man is coming to take out some old stinky carpets. Can yoo imagin how long it's gonna take for me an Beau Beau to get owr stink back into da new ones? Whose breakfast looks better? 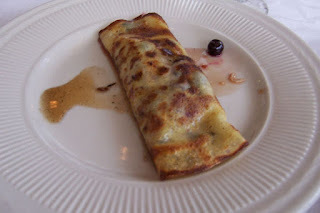 Owr raw chicken bone: Or Mommie's blueberry blintz? Hi Effuryone! It's my Gotcha day today. 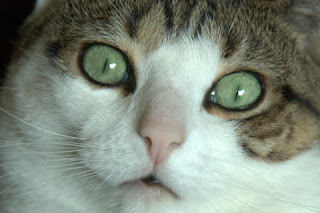 And, it's about time that I got to get on da bloggie. 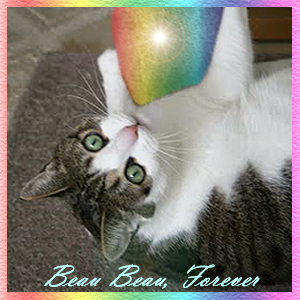 Some blog hog named Beau Beau seems to keep taking ofur. Do yoo see him anywhere? No? Good. It's my turn. Today is the anniversary of the day I found my home. 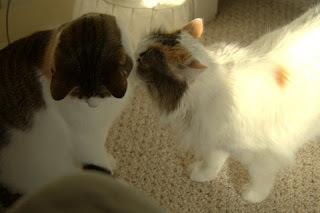 I got into Mommie's head one night and she dreamt of a white furry kitty. She looked and looked for me and one day she finally found me at the Meriden Humane Society. When she walked in da room I ran up to her and stretched my arms out up and she picked me up. Then I snuggled up to her and didn't want to let go. She brought me home and that's when I met Beau Beau. It took a while to get him under control but he was just a baby and I was already five years old. That was three years ago already. I loves my home but now another major event may be occurring. We have heard the Move word. We will know in a few days whether or not we will be moving. Mommie says the new house looks like a big tree wif a million windows. And we will get a ginormous pole wrapped wif ropey stuff so we can climb a squillion feet into the air. Just think of all the parties and fun we can have! One more thing to talk about today. Look at what the squirrels did to owr pumpkin! We never seen anything like it. It got even worse later. They came and took all the seeds out. We think this might be a sign of a bad winter. Have a great Thankful Thursday everyone! Beau Beau's Toes. Just gettin' mine bed ready to go back to sleepy in. It am so comfy dat I just want to keep sleepin' in it. Mom says I am makin' biskits just like da Piney Woods girl cats do. Wait! I'm not a girl! I'm not makin' biskits. I'm just fluffin' up mine bed a bit. Zzzzzzzzzzzzzzzzz. Come on over Powder! It's been a looonnggg weekend . I am still catching up on my sleep after all mine girlfriends came ofur on da day before Thanksgiving for a sleep over. Funny fing is dat I am finally sleeping in mine snuggly bed. It am nice and warm in here. I finks I finally grew into it - hee hee. Happy snoozing and snuggling on dis cold Sunday (at least here in Connecticat). 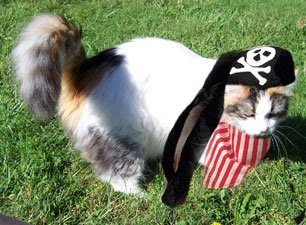 Happy Thanksgiving to efurryone. I am giving thanks to having a great time da nite before and on Thanksgiving Day wif mine human cousins. Mom says I wuz usin' my cuteness to get all dat attenshun. Dey am da nicest girls and dey played da laser lite game wif me for hours an hours. I am so tired now I am goin' to sleeeeepppzzzzzzzzzzzzz. It am hard to see but I put my mark on da nice white just painted walls. It says Beau Beau wuz here. Da beans were not pleased but mostly cuz it shows just how dirty da stinky basement is. 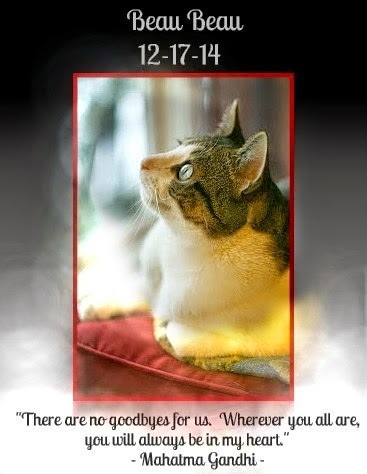 Post Post: We am saying prayers for all those kitties we lost dis year in honor of Fierce Fighter Day for dose kitties dat fought so hard to stay wif of in spite of their poor health and illnesses. 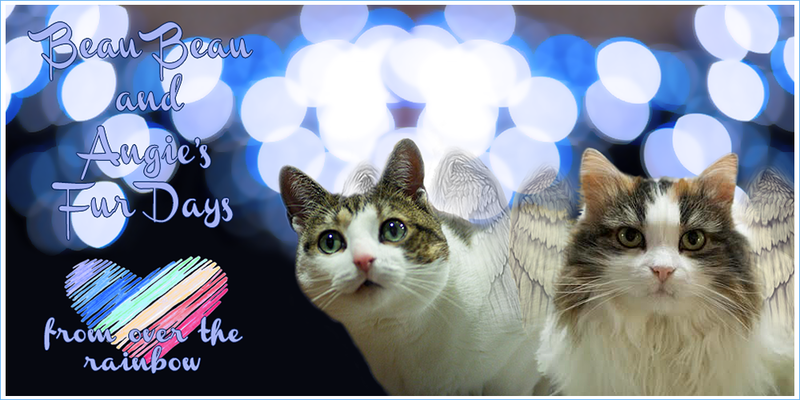 We wish them all wonderful health and fun and happiness over the rainbow bridge. It's finally Friday an after a long week of tellin' da lady what to clean I am inspectin' da job under da sinkie. OK it looks a little better wif da shiny white stuff down so my feet don't get dirty anymore from da poison all ofur da wood. Yep, dis side looks ok too. OK lets check out up top. WHAT??? What da heck? Yoo didn't put somefin in dat hole in da sinkie YET? Sigh. What am I gonna do wif deze hyoomans? Look what happens when I close mine eyes for one minute! Dat flashy fing comed out an tooked a picshure of me snugglin. I loves mine mommie. I'm so glad I found her an she brought me to her home. But we gots news. We herd da werd MOVE. Lots of fings are goin on around her and da bangy noisy guys are comin to do somefin to owr basement where I play wif da insulation. It might be a while afore we MOVE but we am scared. It's finally Friday so lets playyyyyy all weekend! Can somecat get me owt of here ferst please? We are off track somehow. Instead of Tuesdays Toesies or tushies or whatever, how about paws on Thursday? Pssssst, it's reely coz mom is running owt of picshures if yoo can beelieve it. 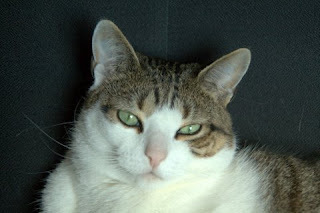 Anyway besides lookin at owr paws and hands, please go to see Luxie coz him is in a lot of pain coz da v.e.t. stole hims teeth just like they did to me. We're hoping that he will reely feel better today and more as his mouf heals up. World War I ended on November 11, 1918. On the same date three years later an unknown soldier from that war was buried at Arlington National Cemetery. November 11 eventually became the date when America honors all who have served the United States in war. We are taking today to remember and honor the soldiers all over the world who served for their countries. I finally got dis raw chicken eating fing down. As a full grown mancat I haf shown dat I can almost eat a whole chicken thigh bone. It looks pretty gross to da hyoomans but I gets to clean my teefs myself with da crunchy bone. Yoo finks dey would finally realize we don't want to eat on da plate? No more monkey on mine back. I got him! Hah hah haha! Don't even think of it. Happy Friday efurryone! It's been a long week wif not enuf 'tenshun from da beans. Gots to keep mine toesies clean, claws sharp, furs white, smellin good. Cleaniness is next to Godliness ya know. Schmaybe if I keep washin mine toes it will remind da mommie lady to keep da floor a little cleaner. Yeah yoo mommie. When we see yoo lickin off da floor den schmaybe it could pass da clean test. Until den, I will spend hours on mine toesies. 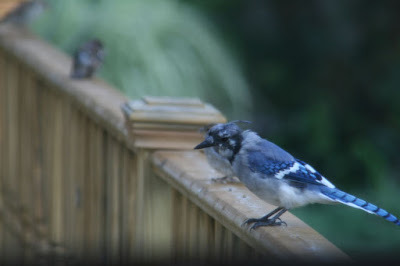 This is our bald Blue Jay from this summer. We don't know what makes them bald like that but we think it's because they are molting. It seems to be the parents that this happens to after the young ones have left the nest. They lose so many of their head feathers that you can see their ear holes. It's kinda gross and cute at the same time! 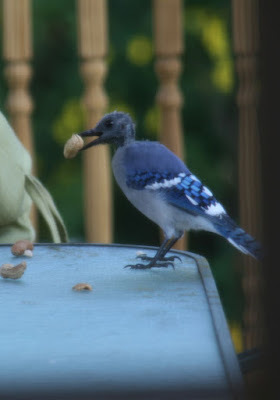 I feed them peanuts in the summer and they go crazy over them. I get at least 8 at a time. Beau Beau and Angie run to the window when they hear them screaming for the peanuts. This one is just starting to lose its feathers. You can see the little tuft left on the top. 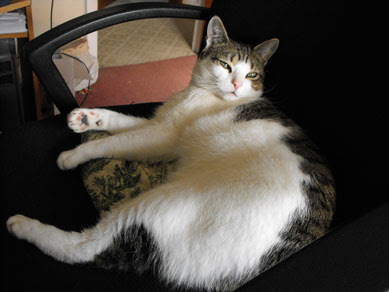 Have a great rest of the weekend efurryone! We gots lots of Moff buggie hunting to do. Dey seem to be flyin all ofur da place.